Disclosure: I received product to facilitate this review. All opinions are my own. Although I was familiar with green tea and its health benefits, I was not familiar with matcha tea powder. I did a bit of research and discovered that matcha powder not only can speed up your metabolism, but is full of antioxidants and has other benefits as well. According to Dr. Oz website, matcha can aid in stress reduction, lower cholesterol, boost brain health and fight cancer. Matcha is a green tea powder. It is used for drinking as tea or added to recipes, such as smoothies. The main difference from green tea is that when you drink matcha, you ingest the entire leaf, not just the brewed water, so you derive greater health benefits. The package was pretty small for the price. Or so I thought till I read that the recommended daily dose is 1/2-1 tsp. The 4 oz. package will last a long, long time. Upon opening it, it smelled like strong green tea. I decided to try it first in a smoothie. My smoothies are made up of plain Greek yogurt, berries, spinach and a banana. With the matcha, the smoothie has a bit of an earthy tea taste, but, in my opinion, not bad. Alone, I am sure it would be a bit bitter, but mixed with fruit in the smoothie, it is fine. Even my daughter said it just tastes like a smoothie with tea in it. It is definitely something I can swallow. I should note that I am one of 15% of the population who is deemed a supertaster (meaning I have more taste buds than most people and am more sensitive to bitter tastes). Next, I tried it in my glass of ice tea. It was a bit more difficult to mix up, but was possible. The tea just had more of an earthy tea taste, but was still good. Other uses for matcha include lattes and in baking. Come cooler weather, I think I will try it as a hot tea. I may also try it in some of the baking recipes included in the free ebook that comes with purchase. I did have concerns about caffeine as I try to avoid it so it doesn't interfere with my sleep. It has a moderate amount, but still less than half of what a cup of coffee is, and that is if you use a whole teaspoon a day. Using half a teaspoon would only be about 1/4 the caffeine that is in the coffee. Of note, this is not premium Matcha, which is very expensive. I have not tasted any matcha before, so I don't know how this compares, but from what I have read, it it probably more bitter than the higher quality (and way more expensive) matcha. But, you reap the same health benefits with the culinary matcha at an affordable price. I will have to admit, the days I have the Kiss Me Organics Organic Matcha, I do feel feel more energetic and feel like I am able to focus more. I cannot attest to any weight loss due to calorie burning as I don't weigh myself on a regular basis, but the research I read seems to conclude that it does indeed increase metabolism. 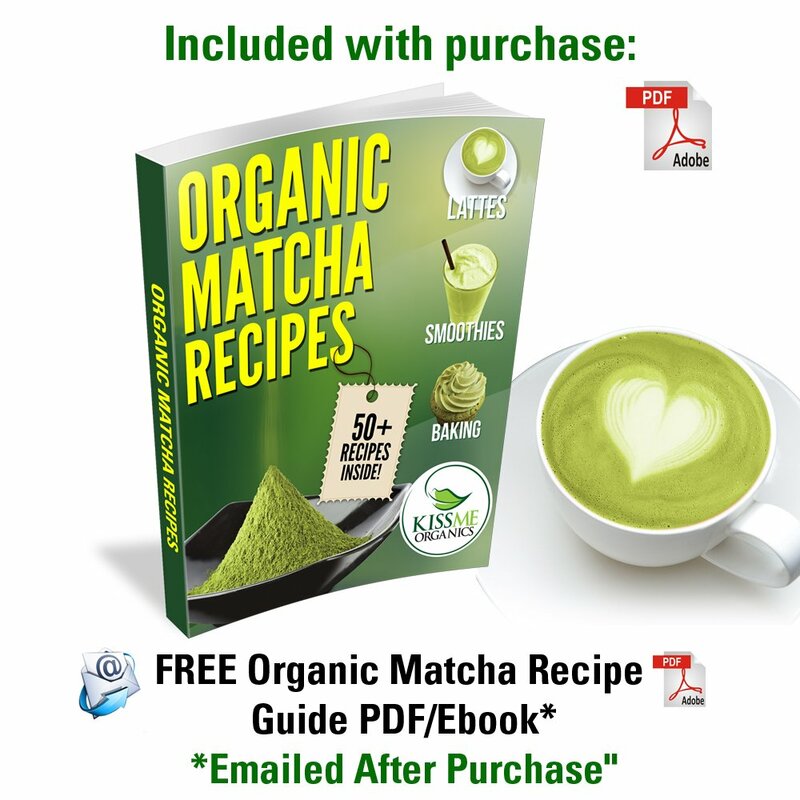 I plan to continue using the Kiss Me Organics matcha daily. 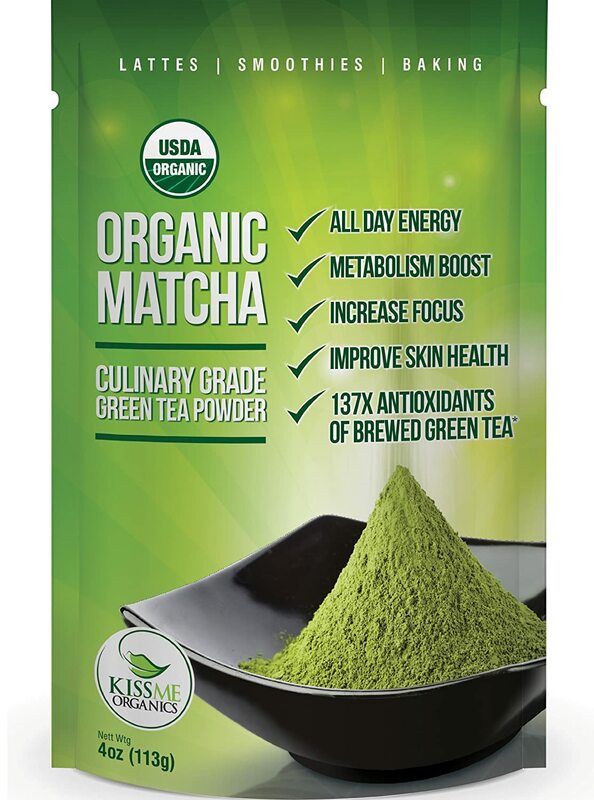 Kiss Me Organics Organic Matcha is deamed USDA organic so you know it undergoes strict testing guidelines. You can purchase Kiss Me Organics exclusively from Amazon.com . Right now, they have a special deal--purchase one bag, get one half off by entering code 8FZV8FL5 at checkout. You will also get a free recipe ebook that will be mailed to you after purchase. It has a 100% money back guarantee, so why not give it a try?